The Caucasus lies on the southern edge of the border between Europe and Asia. 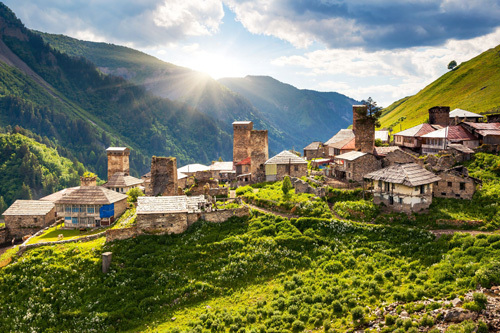 This region is defined by the Caucasus Mountains, a mountain chain where Europe's highest mountain, Mount Elbrus, is located. Regarding its size, the Caucasus area extends between the Black Sea and the Caspian Sea. There are three countries which entirely belong to the Caucasus: Georgia, Armenia, and Azerbaijan. Parts of southern Russia, most notably the federal subjects of Chechnya and Northern Ossetia, are also in the Caucasus. In Eastern Iranian languages (called Scynthian), kroy-khasis means "ice shining". It is believed that the word "Caucasus" derives from there. Alternatively, in ancient Greek, Kafkasos could be interpreted as the "Seagull Mountain". An ancient Greek myth suggests Kaukasos is one of the pillars which supports our world. The Caucasus is known to be one of the places where the earliest human civilizations developed. Human fossils which are 1.8 million years old were discovered at an archaeological site in Georgia. For a long time, the Caucasus had been incorporated into different Iranian empires. Persia (former Iran) was a great rival of Rome, which is why the ancient Romans unsuccessfully attempted to conquer the Caucasus several times. Armenia was the first state to adopt Christianity as its religion in 301 AD. Soon after, Georgia followed. As Persia was conquered by Muslim forces, Islam also penetrated into the region. The Southern Caucasus and parts of southern Russia remained under the Persian Empire until the 19th century. After that, Imperial Russia took control over the area. 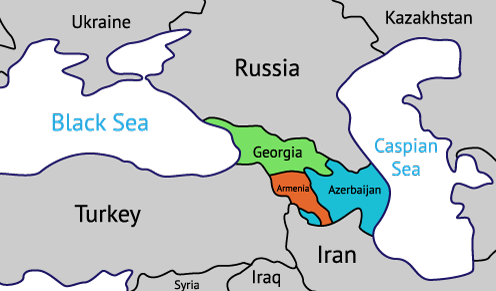 Georgia, Armenia, and Azerbaijan became independent states following the break-up of the Soviet Union in 1991. Georgia is one of the countries with a coast along the Black Sea, and Batumi is its biggest harbor there.  Its name derives from the Greek phrase bathus limen meaning "deep harbor". Today, Batumi is not only the main port city of Georgia but also one of its major tourist destinations. Batumi's beachfront and gambling opportunities attract a significant number of tourists from the region. Although it is not such a large city, Batumi hosts numerous places of worship, including Orthodox churches, a mosque, and a synagogue. Another excellent tourist location is the Botanical Garden, which has different sections with the plants that grow in the Caucasus, as well as in other parts of the world such as the Himalayas and South America. Of course, visiting Batumi without trying the delicious Georgian cuisine would be unimaginable. 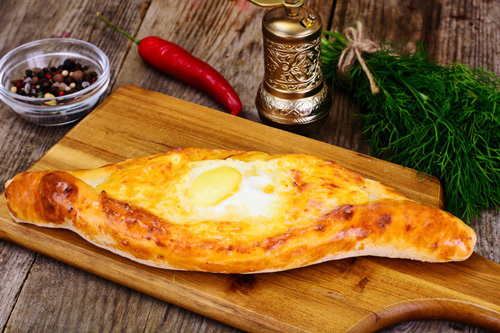 Khachapuri, a boat-shaped bread with cheese and eggs, is a must-try. The capital of Armenia, Yerevan, is one of the oldest continuously inhabited cities in the world. The birthplace of the city is considered to be the Erebuni fortress, built in 782 BC. It is also quite possible that the city was named Yerevan after this fort. As different languages mixed with each other over the years, Erebuni became Erevan (or Yerevan). In addition to the remains of the fortress, there are many other notable landmarks in this old city. Being the oldest Christian nation, Armenia also has some of the earliest churches. In Yerevan, tourists frequently visit the Katoghike Tsiranovar church, dating from the 6th century. A representative of more modern architecture is a massive stairway called the Cascade, located in the city center. While the exterior of the Cascade consists of several floors with fountains and sculptures, the inside is used for art exhibitions. From the top of the Cascade, you can enjoy the view of Mount Ararat. 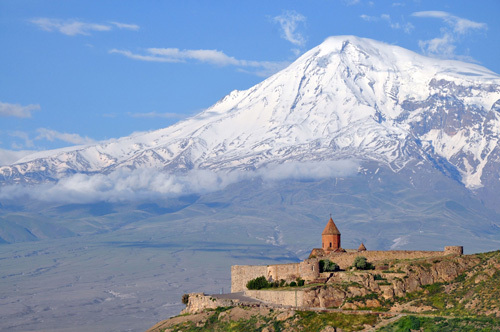 This mountain located in Turkey is one of the principal symbols of Armenia. The Caspian Sea defines the eastern border of the Caucasus. Baku, the largest city in the region and the capital of Azerbaijan, is located there. The city lies only 92 feet (28 meters) above the sea level, which makes it the lowest lying capital in the world. Being a coastal city, it is renowned for very harsh winds. This is also the reason why many people call it the "City of Winds". In fact, the Persian name of the city, Bad-kube means "wind-pounded city". The Old City of Baku serves to tell stories about the city's antiquity. It is a rather small area that can be seen on foot in only one day. This is where the Palace of the Shirvan Shahs, a 15th century complex with the palace, a mosque, and a bathhouse, is located. Another important historical place is the Maiden's Tower (Giz Qalasi), which was used as a fortification for defense, but also as an astronomical observatory. Boat tours of Baku's coastline are another great way to get to know the city. The highest point on Mount Elbrus is at 18,510 feet (5,642 meters), which makes is the tenth highest peak in the world. Located in southern Russia, Elbrus is actually a dormant volcano. The last eruption took place almost 2,000 years ago. The difference between the two summits (the east and the west) is only 3.2 feet (1 meter). While the east summit was first ascended in 1829, the west summit was only conquered in 1874 by a British expedition. The name Elbrus derives from Alborz, the name of a mountain range in Iran. Etymology suggests that the word could mean "high, tall". 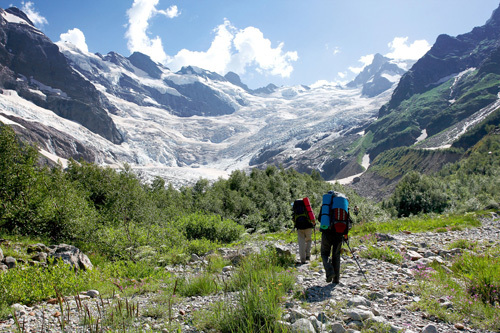 Nowadays, Mount Elbrus attracts adventurous tourists. With the help of cable cars, the ascent to Elbrus is not too demanding and can be completed in a day. The Elbrus Race is a very popular event, where the fittest of all participants race all the way to the summit. Other options such as a mountain marathon or an 11km long race are also available. The Maiden's Tower used to be an astronomical ___________. The ___________ participants race all the way to the summit. Alborz is a mountain ___________ in Iran. Greeks believed Kaukasos was one of the ___________ supporting our world. 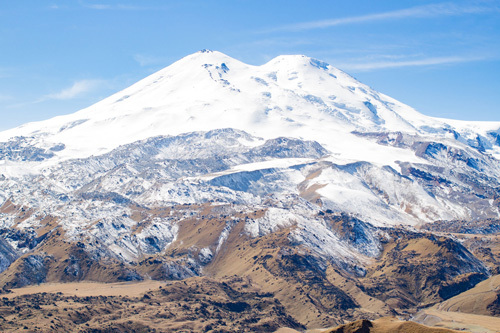 Mount Elbrus is a ___________ volcano. 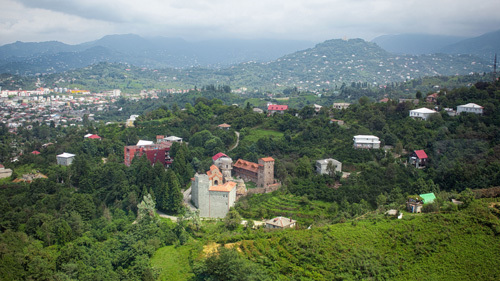 Batumi is Georgia's ___________ port city. Following the break ___________ of the Soviet Union, several states became independent. Baku is the lowest ___________ capital in the world. Taking a boat tour is a great way to get to ___________ the city. The Old City of Baku tells ___________ about the city's antiquity. Who called the Caucasus the "Seagull Mountain"? Where do the plants in the Batumi Botanical Garden come from? Which city is known for strong winds? What is the Cascade in Yerevan used for? Why is the ascent to the Elbris summit not so demanding? Parts of northern Russia are in the Caucasus region. Parts of southern Russia are in the Caucasus region. The last time the Elbris volcano was active was a long time ago. The last time the Elbris volcano was active was in recent history. 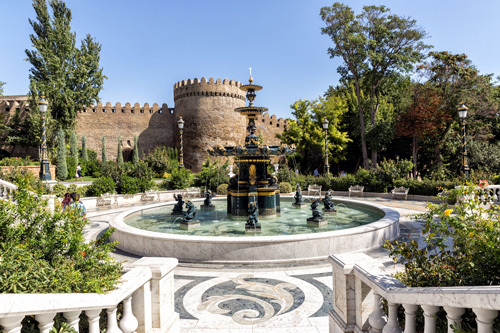 "It takes at least a week to sightsee around the Old City of Baku." "Armenia adopted Christianity as its state religion before Georgia."